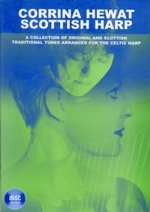 The book is a varied collection of pieces from the Scottish tradition, while also containing some original material. There are tunes for the beginner harper through to the advanced player. There is something in here to inspire and challenge everyone, and I hope you enjoy learning these tunes as much as I have enjoyed arranging and recording them. Of course the problem is what to put in a book, and what to leave out. There are so many tunes out there, it would be impossible to put all my favourites into one book, so I have chosen the pieces which I have found are favourites with pupils and audience alike. I have been lucky enough to study, and work with some of the best and most wonderful harp players I know, [including Maire Ni Chathasaigh, Deborah Henson-Conant, Laoise Kelly, Kristen Nogues, Catriona MacKay, Christine Martin, Mary Macmaster, Isobel Mieras, Sanchia Pielou, Llio Rhydderch, Patsy Seddon, Savourna Stevenson, Wendy Stewart and Park Stickney] and I would like to thank them all for their support and encouragement. I am deeply grateful for the inspirational music and knowledge they have all shared with me throughout the years. 1. Oran Na Maighdinn Mhara - trad. The first traditional Gaelic tune I learnt as a beginner, attending Savourna Stevenson’s weekend clarsach course in Fort Augustus. 2. Tuireadh lain Ruaidh - trad. The lament for Red-Haired lain, another traditional Gaelic song I heard while attending the Feis Rois course in Ullapool in 1984. 3. Marry Me Now - trad. I have modified this tune slightly to give it a more relaxed feel, but instead of the syncopation on beats 2 of bars 2 and 4, you could play it with ‘doubled’ or ‘tripled’ A notes. 4. The Massacre of Glen coe - trad. A traditional tune I found in Alison Kinnaird’s ‘Small Harp Tutor’ book. The arrangement is a very melancholy one and can be interpreted as ‘rubato’ as you wish. 5. The Ewie with the Crooked Horn - trad. I recorded this Strathspey with the band Bachue. The arrangement is meant to have a ‘snap’, and so there is the opportunity to damp notes (as in beat 2 of bar 1, 3 + 4) by replacing fingers immediately to stop the string ringing. 6. Gin Ye Kiss My Wife, I’ll Tell The Minister - trad. This tune has special meaning for me, as it was the first traditional tune I’d ever arranged for the harp. And it made my mum very proud! This composition was auctioned to raise money for Feis Rois. It was bought for a soon-to-be born niece, so I wrote and named it for her. 8. Gillean an Drobhair - trad. A tune from The Skye Collection I learned in Alison Kinnaird’s class at the Adult Feis in Dingwall many years ago. This tune is a favourite with my students. 9. Isle of Aigas - trad. This tune is in The Simon Fraser Collection. I first heard it being played by the wonderful Scottish harpist Catriona MacKay, and instantly fell in love with it. 10. The Old Reel - trad. I heard this tune being played by Alasdair Fraser in the barn at Sabhal Mor Ostaig Gaelic College in the Isle of Skye. It makes a good set with the G minor reel. 11. G minor Reel - trad. I have no idea where this tune came from but it was found on a loose piece of manuscript lying around the house. I have since referred to it as the G minor Reel for obvious reasons. I found the music for this in my mum’s fiddle case. I found out later it was a tune she was learning from her fiddle tutor, Lain Fraser. A tune inspired by ‘Plum’ my sister’s cat, who was a lovely dancer. I have added chord symbols instead of a written left hand part as it is an opportunity for you to try out your own accompaniment ideas. This tune was written for my goddaughter. It is written in three parts; the first for her dad, the second for her mum and the third for Marsaili herself. She has since donated the repeat of her part to her younger sister Gracie! I learnt this from the Shetland fiddler, Catriona Macdonald. I arranged it for two harps as an exercise for one of my harp classes. I hope it demonstrates how simple it can be to accompany another instrument with basic ideas found in the tune. 16. Sgian Dubh - trad. There is no left hand part in this tune mainly because it was written as a ‘fiddle’ tune, but I have marked * where it is possible to bring in another harp (or another instrument) and play the tune as a ‘round’. This piece was written after a trip up to the Skye Folk Festival in 1994. 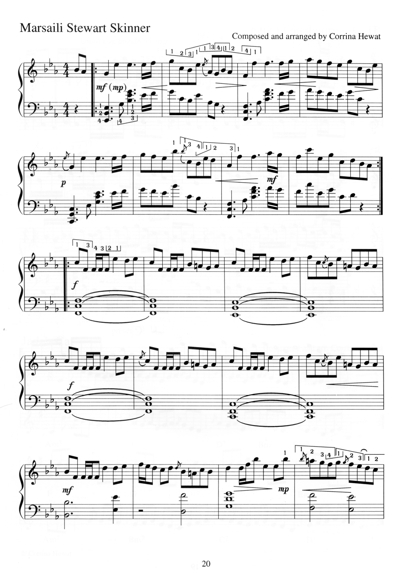 It is more contemporary in style, but is based on a traditional-style tune. It encompasses an amazing trip for me, musically and emotionally.